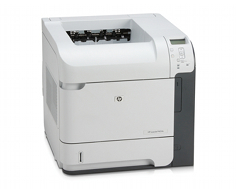 Built for workgroups that move large quantities of paper regularly, the LaserJet P4014 is a high-speed black and white laser printer built to handle large volumes of printer in a surprisingly compact form factor. For an office trying to avoid clutter and maximize space, the P4104 offers many features and many opportunities for expansion not necessarily available in similar-sized workgroup printers. The printer measures 16.5" by 17.7" by 15.5" and weighs 56.92 lbs. This compact size allows it to sit comfortably either on a desk or on its own piece of furniture, such as a credenza. With all doors and trays fully opened, it measures 15.5" by 34" by 16.75, which if used regularly may make the printer unsuitable for placement on a desk. The P4014 offers maximum print speeds of 45 pages per minute when printing to letter paper and up to 43 pages per minute when printing to A4-sized paper. This is well beyond standard and excellent for processing large documents or many copies of smaller documents. The P4014 will print to letter, legal, executive, statement, Ar, A5, B6, double postcard, 16K, executive, and Com 10, Monarch No.7 3/4, DL ISO, C5 ISO, and B5 ISO envelopes, as well as custom paper sized between 3" by 5" and 8.5" by 14". It will print to paper, envelopes, labels, cardstock, transparencies, and user-defined media without any trouble. The P4014 prints at resolutions between 300 dpi and 1200 dpi, consistent with most laser printers. The printer includes a 500-sheet tray and a 100-sheet multipurpose tray standard, which can be expanded to a maximum of 3100 pages by adding two 1500-sheet trays. Like many other HP printers designed for high-volume office use, a number of other add-ons are available, including a 500-sheet feeder, an automatic duplexing unit, an envelope feeder, a stapler/stacker, a standalone stacker, and a multi-bin mailbox. The P4014 features 96MB of RAM built-in which can be expanded, if necessary, to 608MB via 144-pin 32bit DD2 DIMMS. Note that the P4014n includes 128MB of RAM, making it expandable to 640MB. However, the printer only includes one slot for memory upgrades, making it impossible to upgrade the printer gradually; it will either need to be maxed out at its first upgrade or have its memory removed and replaced. The HP Jetdirect print server includes a number of security features, including SSL/TLS, Port authentication, and wireless encryption via WPA, WPA2, AES, TKIP, and WEP if using a Jetdirect 690n Wireless Print Server. All of the printer's add-ons add weight and expand the size of the printer, and adding several of them at once will almost certainly require that the printer have its own piece of furniture. The optional 500-sheet feeder measures 4.8" by 17.7" by 16.3" and adds 14.7 lbs to the printer. The 1500-sheet tray measures 10.4" by 20.1" by 16.6" and adds 28.7 lbs. The duplexing unit measures 6.1" by 13.7" by 13.1" and weighs 5.5 lbs. The envelope feeder measures 4.4" by 13.9" by 12.9" and also adds 5.5 lbs of weight. The stapler/stacker measures 14.6" by 16.9" by 15.2" and weighs 9.3 lbs, the stacker measures 12" by 16.9" by 14.9" and weighs 7.1 lbs, and the mailbox measures 20.6" by 12" by 13.9" and adds 15.4 lbs of weight to the printer. The P4014 does not include networking support by default, nor does it offer support for legacy PCs. If you need networking support for your environment, you will need to purchase the P4014n, which includes an HP Jetdirect Gigabit Ethernet embedded print server or add one to the base model. However, the P4014n's additional memory may make it a better candidate for a networked environment. 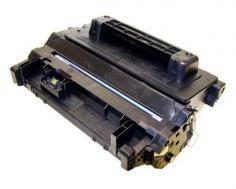 Review it: "HP LaserJet P4014n "
The P4014's toner cartridge requires replacement at every 10000 pages rated at 5% coverage. The drum unit is built into the toner cartridge, bringing down the amount of time you will need to spend replacing parts to ensure printer function but possibly bringing up replacement costs over the printer's lifespan.